The Sacred Triduum is over, the voice is recovering, the dust is settling more serenely again in the abbey church and in the sacristy, the oil has dried on the confirmandi, a friend’s welcome fleeting visit is now a pleasant memory, and the internet here is actually working today, so it seems timely to post. Though it is a dreaded moment in many respects. The busy-ness of our Triduum has proved a welcome distraction from the Triduum as it unfolded in Rome. For in many ways the passing glances I directed Romewards dismayed me. No need to tell you why: the blogosphere has been abuzz with reactions to the papal Maundy Thursday Mass and mandatum in the juvenile penitentiary. What was there to react to? one might ask if still unaware of what transpired. The very choice of location was both inspiring and dismaying. A juvenile prison is an apt place to find a Catholic pastor, even its Supreme Pastor. It was a striking reminder to us not to forget those at the margins of society and so easily forgotten, not least those young enough to be re-aligned to the right path in life. It was a striking reminder that Christ came to call sinners to repentance not to chill out with the saints, just as a doctor exists for the sick more than the healthy. That was inspiring – to see a pope wash prisoners’ feet. But to go there for Maundy Thursday and the Mass of the Lord’s Supper may be inspiring, but it is also problematic. Whether he like it or not, Francis is Bishop of Rome, as he consistently reminds us; but for that very reason he is also pope. He is successor to Peter, Prince of the Apostles, and so is Supreme Pastor of the universal Church. A pope’s role is not confined to the diocese of Rome, but encompasses, with varying degrees of intensity and activity, all the Church. It is possible to be a good Catholic without ever seeing the pope; it is not possible to be one without acknowledging his authority. Likewise, it is impossible to be a good pope without acknowledging ultimate earthly responsibility for the universal Church, whose servant the pope is. So this brings us to why Pope Francis’ Maundy Thursday evening was dismaying. He was not available to all the Church as he normally would be. His Mass was not, in any real sense, public, but private in the way Neo-Catechumenate liturgies are private: open only to a privileged few. There was no live coverage, and few photos (for obvious reasons of prison security and juvenile prisoner privacy). No one could have just walked in to attend the Mass, nor could anyone get a ticket for it. Even if one were to argue that such visibility to the universal Church is the recent product of modern technology, it still fails on a diocesan level. As Bishop of Rome Pope Francis did not lead his diocese in worship in one of the most important Masses for any diocese, one which celebrates the inauguration not only of the Blessed Eucharist, but of the ministerial priesthood. He was not available to his diocese even as he has been restricting his reference to his ministry to “Bishop of Rome”. The argument that he had not yet taken possession of his cathedral (which I have been wielding in his defence) is a thin one: normally a new pope takes possession of the Lateran basilica within a few days of his inauguration. And he had three other basilicas to use! It smacks of the the Jesuit preferential option for the poor. That in itself can be a noble posture. 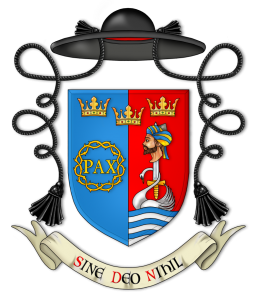 But it suits better a more unfettered Jesuit than a bishop, whose preferential option really must be for his diocese, and all its members. And it should be remembered that both Benedict XVI and Blessed John Paul II said Mass in the very same prison, though on days when they were free to celebrate anywhere, not on days when they were obliged to lead the worship in their cathedrals. As it happens, the current Roman Catholic practice of performing the mandatum in parishes, even when restricted as it is to men, seem anamolous. Byzantine Catholics and the Orthodox restrict it to bishops washing the feet of 12 of their own priests. This, in fact, is the ideal way to commemorate the mandatum in its context of Maundy Thursday. It is possible, naturally, to perform the mandatum, outside the context of Maundy Thursday. 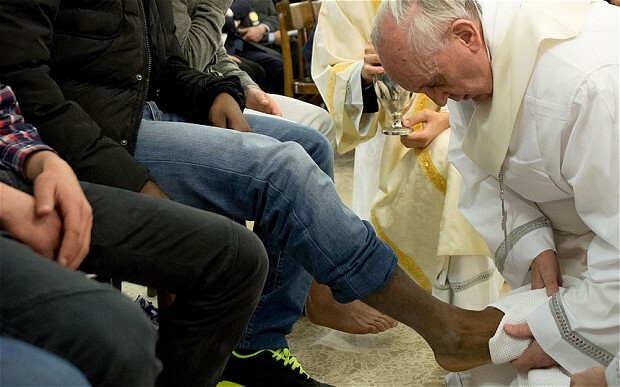 In this freer context Pope Francis could wash anyone’s feet, man or woman, Catholic or not, and in a far more public way. 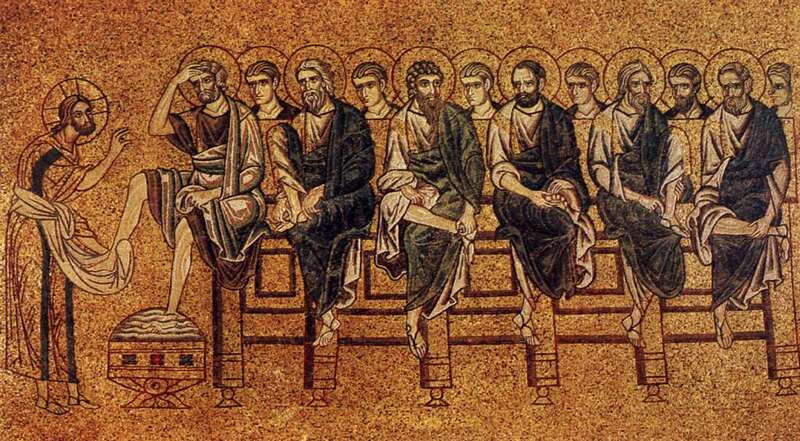 Indeed, as if to prove there is nothing new under the sun, “In the latter half of the twelfth century the pope washed the feet of twelve sub-deacons after his Mass and of thirteen poor men after his dinner” (Catholic Encyclopaedia). Could not Pope Francis follow this fine tradition? Instead of choosing a context outside of the Mass of the Lord’s Supper, Pope Francis has lamentably broken the clear liturgical law that only men’s (viri) feet may be washed, and needless to say, these men should be Catholic. While the symbolic association of the mandatum with ordination at this Mass is an ancient tradition, it does not have the force of dogma. It is reformable. Pope Francis could have decreed that henceforth the mandatum were to be seen not as related to ordination, but to the lives of all who are admitted to receive from the altar of the Eucharist. Then, having abrogated the rubrics currently in force, he could legitimately have washed the feet of all and sundry, and been setting an unimpeachable example. Instead, he has set an example of breaking liturgical law without batting an eyelid or offering a justification for breaking the Church’s laws. Even our Lord explained why he broke Jewish traditions (though I think the comparison with our Lord in this context is at best strained, and more likely plain invalid). A prominent canonist has argued along this lines from a canonical standpoint. What made matters worse was the ham-fisted attempt by the Vatican Press Office to justify the Pope’s actions after the event. You can read the statement and an analysis of it by Fr Z. In short the VPO attempted to argue that because the community was small and included women, and that majority would not have understood the traditional and legal way of performing the mandatum, then it was justifiable to do as Pope Francis did for these pastoral reasons. But our canonist unravels this line of argument very quickly and comprehensively: whether the gathering is large or small, the same legal principles apply – they are not determined by there mere size of a congregation; nor do principles only apply when everyone understands them fully; and that the dichotomy many try to erect between law and love, legalism and Christian liberty, is a false and dangerous one. In the final analysis, for all its powerful symbolism of recognition of society’s marginalised, the actions of Pope Francis had other effects and consequences, ones which are disturbing. One is that he effectively teaches that liturgy can be crafted and shaped ad hoc according to perceived didactic needs: the Mass as a teaching tool, and as belonging to each congregation. However, as the Church has always taught, the Mass is the property not a local community but the universal Church. It is by the common celebration of one liturgy (including its legitimate options) that the various local churches manifest their unity with each other and the universal Church. They do as the whole Church does, not as each would like to do any any given day. 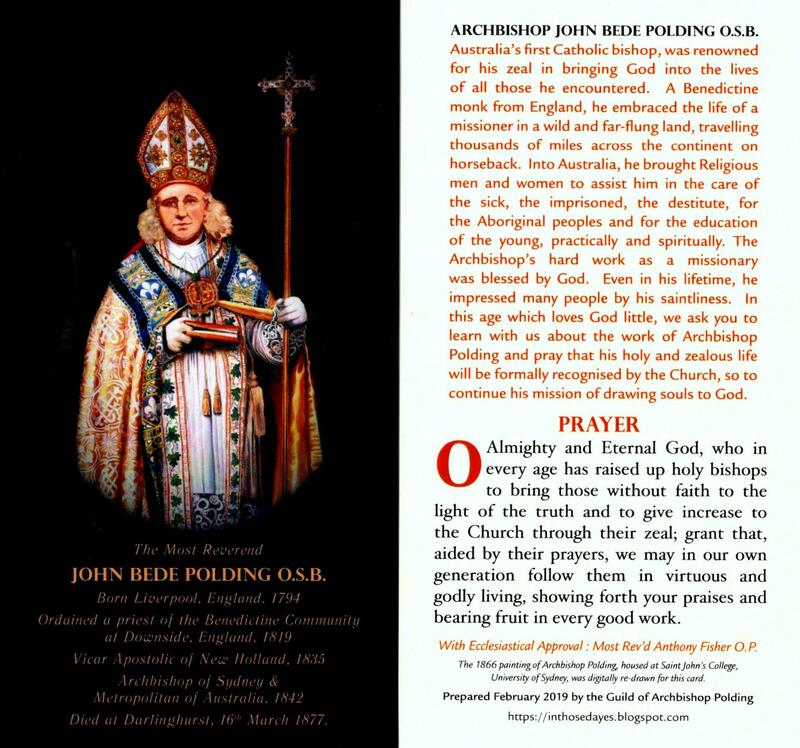 in virtue of my ministry of confirming the brethren (cf. Lk 22:32) I declare that the Church has no authority whatsoever to confer priestly ordination on women and that this judgment is to be definitively held by all the Church’s faithful. Since the Church has no authority to ordain women, Pope John Paul II was similarly bound to accept that limitation (as is every pope after him). He had no authority to change it. Popes are infallible only in a strictly defined set of circumstances, pertaining to matters of faith and morals. Otherwise popes can, and have been, very fallible even in their Church governance. If they were not, how could so many saints in history (like St Catherine of Siena) have criticized them as the need arose? Yet, whether they speak infallibly or not, popes must be taken seriously in what they do and say. They cannot be lightly ignored. But sometimes they do get things wrong in the lower order of affairs. Lower or not, these can still be disruptive and unsettling. The pope is the Church’s supreme lawmaker, but he is not thereby above the law. He might change a law, but until he does so he is no less bound by it than we are, despite what some prominent Catholic commentators might say to the press. In his defence, Pope Francis is acting a way consistent with his practice as Archbishop of Buenos Aires. He is not suddenly playing to the cameras now that he has the international spotlight. What he must remember, though, is that he is no longer in Buenos Aires, but is Bishop of Rome, and the rules are very different now. He is even less free now to do as he pleases. All his actions must be ordered, first and foremost, to the ultimate good of the Church, and that ultimate good lies in heaven, not on earth. Let us pray for Pope Francis that he righteous zeal might be more discerningly directed. And may God forgive my presumption. Next Post **Blushes** I’ve been liebstered. Is the Pope bound to the authority of the liturgical books? Yes, but remember that he also has the power of dispensation. There are things in the liturgy which are unchangeable–the use of bread and wine, for example–which not even the Pope can derogate from. But for the others–“merely ecclesiastical laws”–the Pope may dispense anyone from them. So, for example, before the Second Vatican Council, to say Mass a priest had to have use of his thumb and index finger to hold the host. The Jesuit Priest–now saint–Isaac Jogues had his fingers removed by the Mohawk Indians then living in Canada, whom he was trying to evangelize. The Pope at the time dispensed him from that liturgical law so that he might continue to say Mass. “As a general rule, in the law one who has the power to dispense others has the power to dispense himself, unless explicitly prohibited from doing so. Here, the Pope clearly has the power to dispense from the rule that the washing of the feet be limited to men. In fact, he is the only authority with the power to do so, as the law explicitly reserves the regulation of the Sacred Liturgy to him. Since he has the power to dispense others, he can dispense itself. Therefore, those who say the Pope somehow acted illicitly by washing the feet of women on Holy Thursday are simply wrong. He has the legal authority to do so, and such an action is completely legitimate. I admire you for your stolid defence of Pope Francis, and indeed every good Catholic heart would seek first to defend the pope, whoever he might be. That has been my approach thus far, though I am finding it harder to maintain, as evidenced in this post. However, I have to agree and disagree with you. Yes, the pope has the power to dispense even himself from merely ecclesiastical, and thus reformable, laws. However such a dispensation in such a case as this would have to be a public act of papal authority, and such is usually done in writing. There has been no public, specific act of dispensation, not even in word, let alone writing. To dispense oneself on the fly, IF that is what the pope has done, seems almost to be an abuse, indeed a trivialization, of the power of dispensation. IF that is what he has done it is yet another area in which he needs to leave his Jesuit heritage behind and remember that he is now pope, and his actions count in more ways than he might realize. If that be true, then I am afraid the Protestants might have a point! “Whether he like it or not,” Thanks for the subjunctive. Very good article which I will share, if you don’t mind. Thanks for this discussion. I cannot comment on the finer points of the theology, but I certainly think there is a practical issue here. We need strong leadership from Pope Francis about the right way to do things, and also maybe we need an explanation of why it is the right way. 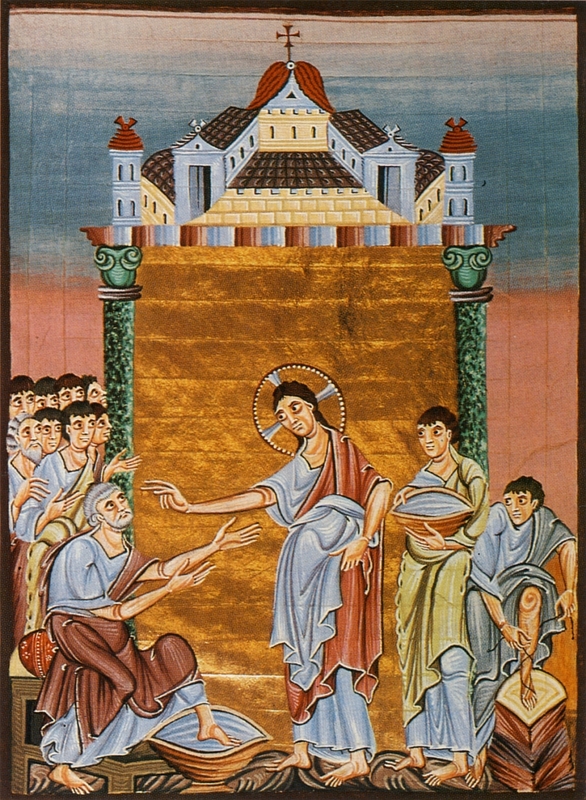 – open invitation for the foot-washing @ Maundy Thursday Mass, so some women did self-select and participate. There is a strong focus on being inclusive and welcoming. No-one intentionally disregards the rules; but no-one seems to understand how important they are, or the theology which created them. Everyone I spoke to was thrilled that Pope Francis had made such a powerful statement about being welcoming, inclusive and forgiving. None of us realised that he should have chosen a different Mass to make this statement. Maybe it is ok for the Pope to change things to make a point. Probably he has reasoned, logical arguments for doing so. But we actually need him to do things the right way; to lead by example and maintain unity. How sad that some places such as your parish are regressing in to the bad old ways that did not work. I guess the problem is that too many will not see that they did not work, and in fact were highly detrimental to the life of the Church. Pope Francis has given such places and people a fillip, but it will not likely last long. Francis has some very un-PC ideas! I agree that the Pope could change things to make a point; but the point is lost unless he explains it and justifies it. That is what we needed to hear. It is possible to honour church order and make a point. Early days, thank goodness, and he will learn how different the papacy is to being a normal diocesan bishop. Fr. Hugh, thank you for this post. It is by far the best I have seen in the Catholic blogosphere on the subject. I also wonder Fr. if you know of if anyone knows if all those who had their feet washed also received the Lord in Holy Communion. It would be a very grave matter if they were allowed to do so or if any other non Catholics came forward to receive. Thank you! You make me blush. As to your question, I do not know, nor have I heard it mentioned. Footage of the Mass was quite restricted, so I am not sure if Communion fell under a camera’s gaze. Certainly no one seems to have been complaining about inappropriate Communions, so I suspect the Pope kept to Church teaching on that one. We might allow ourselves to presume as much. “pope” francis isn´t infallible, he isn´t even catholic, he´s a heretic. Mmmm. I feel quite certain that Francis is not a formal heretic. Even if he were, I would be calm on a more general level because I know that Christ would not let any pope’s peccadilloes lead the Church into error. This is one of those “bottom line” parts of the Catholic faith. History shows that popes have been inadequate, some silly, some very imprudent, and some scandalously immoral. Yet we never have the right to do without them; the only Catholic response is to endure such popes, and to pray for them. Indeed I am convinced that when the Church is not zealous in praying for its pope, the papacy suffers. Pope Francis has made so me decisions that are questionable certainly in terms of prudence, and unsettling in terms of policy. Yet he is a validly elected pope, and so pope he is. So we’d best be learning to live with him, and certainly to be praying for him.